I tried 3 recipes so far, and all good! I made the brussels sprouts with pancetta, walnuts, balsamic and blue cheese. What a unique flavor profile. I was skeptical, but it was awesome. I toasted the walnuts before adding, which wasn't mentioned in the book. Another recipe I made was the spinach mushroom artichoke soup, another stunner, not at all bland. Though it does make me crave cheesy spinach artichoke dip. I also made the Lemon Curd! The Keto Reset Instant Pot Cookbook by New York Times best-selling author Mark Sisson, introduces 75 new quick and easy electric pressure cooker recipes, authorized by Instant Pot(R), for anyone on a ketogenic eating plan. 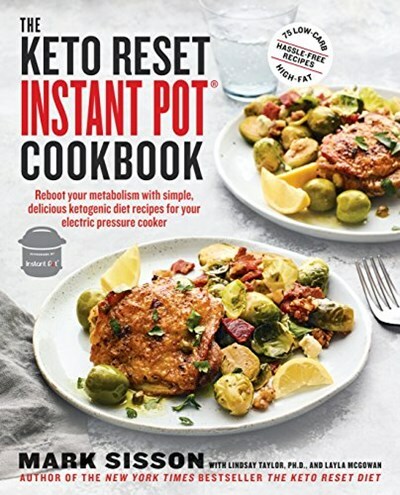 If you want a no-fuss way to get high-fat, low-carb meals on the table faster, The Keto Reset Instant Pot Cookbook makes following a keto-friendly diet easy with 75 all-new pressure cooker recipes. Mark Sisson, author of the New York Times bestseller The Keto Reset Diet and publisher of the number one paleo blog, MarksDailyApple.com, helps you escape carbohydrate dependency and undergo a total health transformation without following a restrictive diet or sacrificing great taste and variety. You'll discover the tenets of ketogenic eating and why burning fat for fuel is so effective for sustained weight loss and improved health. Try Instant Pot basics like eggs, bone broth, and steamed vegetables; perfect a pot roast or a whole chicken; indulge in nutritious savory treats like lemon cheesecake instead of junk food; and boost your creativity with entrees like Bacon Cauliflower Leek Soup, Spaghetti Squash with Red Sauce and Pine Nuts, and Garlicky Mussels. Free of added sugars, processed grains, and refined vegetable oils, all the recipes are aligned with the low-carbohydrate, moderate-protein, high-fat ketogenic diet guidelines and are an easy and delicious way to help you reboot your metabolism in no time. The Primal Kitchen Cookbook: Eat Like Your Life Depends On It!